If you’re in an industry where there’s customer confusion, shady practices, or customer doubt and mistrust (and you probably are), one of the most powerful things you can do is to coach customers on how to carefully choose, wisely buy and more effectively use what you sell. Become their ‘caring coach’. There are many ways to do this, from one-on-one interaction with customers to informative packaging, your web site, helpful check-lists, help-lines, informative advertising, blogs, e-newsletters, on-demand videos or webinars. Five things you can do to drive safer and improve tire wear (or reduce energy consumption, the risk of a heart attack, etc.). Chip Loughead of Gravenhurst Plumbing and Heating in Muskoka, Ontario, runs regular ads in his local paper titled Chip’s Tips. He doesn’t advertise furnaces or hot water heaters. Instead, he positions himself as the ‘caring coach’ by telling folks how to chose what’s best for them and then how to maintain it for maximum performance and longevity. Very clever. Max Hitchins of Sydney, Australia is one of the world’s most respected hospitality industry gurus. In fact, he promotes himself as The Hospitality Doctor. Every couple of weeks Max sends out a short e-newsletter with one specific hospitality tip, secret, scam or remedy. 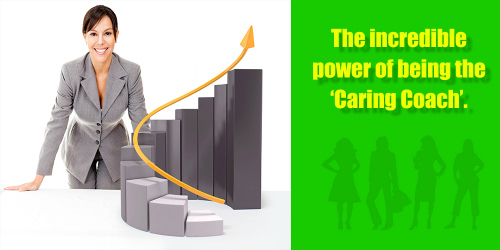 He has become famous and very busy in his niche market by being the ‘caring coach’. The Amazing Food & Wine Company of San Francisco offers a selection of five popular priced wines in bottles that feature a picture of the foods that they are ‘designed’ to go with. This graphic ‘coaching’ is a real break with tradition, but it makes it easy for folks to choose an appropriate wine. How could you use simple graphics to coach your customers to make good choices? High-end home builder Hush Homes has redefined the experience of buying and owning a custom home by becoming the ‘caring coach’. As part of the planning and design process, a Hush consultant meets with buyers for in-depth discussions about the lifestyle they envision having in their new home. The clients are then involved in every step of the process to make sure their wishes and vision are being executed wonderfully. Hush has interior design packages and special arrangements with top furniture, linen and tableware manufacturers for unique merchandise at special prices. Companies like FRETTE linens and Rosenthal china. When the purchaser moves into their home, Hush morphs into Concierge & Property Management mode with its Home Services Program, including semi-annual inspections of all operational systems for as long as the homeowner remains in the home. Hush will also organise and supervise outside seasonal maintenance, arrange for a painter, hire a party planner or have someone keep an eye on the house while the owners are away. This is a whole new definition of what a home builder can be. It is home ownership made special and ‘stress-free’. Now, here’s the part that’s not at all surprising. Naheel Suleman, the visionary founder of Hush Homes, did not come out of the home building industry. He’s an outsider who brought a fresh, new, disruptive approach to an industry that traditionally has the builder and the customer hating each other by the move-in date …or shortly thereafter. A few years ago, I convinced our local butcher to ask customers if they want their roast to be rare, medium, or well done and then to write the weight, cooking temperature and cooking time right on the wrapper. He tells me that customers love it and it’s a personal touch you won’t get at the big supermarkets. He also offers free kitchen knife sharpening on Mondays and Tuesdays, when he’s not so busy. This has increased sales considerably on both those days, and it got him written up in the local paper. How might you coach customers to be more successful with what you sell and what simple acts of kindness could you offer that will build both relationships and sales? A garden centre could write a weekly gardening column for the local paper reminding folks about the hundreds of things that every gardener wants or needs to know throughout the year. When is it time to plant or prune, or fertilize, or deal with insects and which product is best? As a gardener, I know the list is endless – and I need reminders. The same ‘gardening tips’ column can be posted on their web site, sent out as a blog to their database and printed out as a take-away sheet at their garden center. They could even become the gardening expert on their local radio or TV station appearing every few weeks to coach and take calls. That makes them the ‘caring coach’ and a celebrity. That’s marketing magic. Progressive Direct Auto Insurance is committed to helping folks pick the lowest cost insurer for them. So, when Progressive gives a quote, they also include quotes for the same type of insurance from two or three of their competitors. A gutsy move? Sure, it is. But it has made them the third largest auto insurer in the United States. What are you absolutely committed to and how gutsy are you prepared to be in helping customers do what’s best for them? Being the ‘Caring Coach’ also includes warning folks about the shady practices in your industry and promising you simply don’t do those things. A marble and granite contractor recently told me that he was losing business to unscrupulous competitors who promised to complete the job in just four days. It’s impossible to measure, design, order, receive, cut, fabricate, polish, deliver and install stonework in four days. It can’t be done. But they lie to get the order and a 50% deposit. Then, they call in three days to say there’s been a problem and it will be ten days. It was always going to be ten days. By exposing these shady practices and explaining why it takes ten days to do the job right, my contractor friend usually gets the business. Become the Mother Theresa of your industry. Be the voice of reason and truth and do the right thing. You’ll tick off the bad guys, but customers will love you. All these tips and warnings should be on your web site and in your sales literature. And, they can be a part of your regular customer e-newsletter. You can also share this information by writing articles for your local paper or industry trade magazine. So, what are your customers confused or stressed about? How can you help them make the right decision for them? How can you use tips, warnings, insider secrets or helpful hints to help and inform your customers while positioning yourself as the trusted and respected authority on what you sell?